Tall plants produce good crops of small to medium sized dense, bright green buttons with excellent flavour. They hold well, giving a longer harvest period and show good disease resistance. 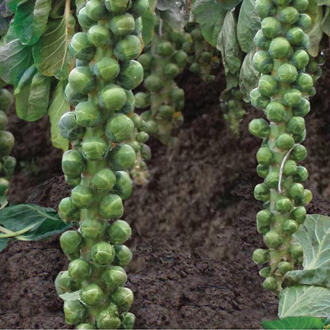 Brussels sprouts do best in an open, unshaded position on fertile, well drained, but moisture-retentive soil. Sprouts are a leafy crop and therefore require a fairly high level of nitrogen, especially as they have a long growing season. A top-dressing of high nitrogen fertiliser once the plants are established will be beneficial. Sites which have been well-worked and manured in the autumn before planting will produce the best crops. Do not grow Brussels sprouts in a part of the garden which grew brassicas in the previous season. There is no need to fork over the ground prior to planting out – all that is required is the removal of weeds and any plant debris without disturbing the soil. This will ensure the young plants establish well and gives their roots a firm foundation. The plants can sometimes become quite tall and may therefore need earthing up to keep them secure in the ground.